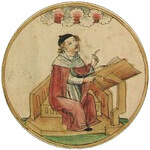 Calculations at a torus. R ist the distance from the center of the tube to the center of the torus, r is the radius of the tube. With R>r it is a ring torus. A ring torus is a toroid with a circle as base. With R=r this is a horn torus, where the inner side of the tube closes the center of the torus. This calculation is for ring and horn torus. 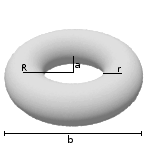 With R<r, it is a spindle torus. Enter both radiuses and choose the number of decimal places. Then click Calculate. The radiuses have the same unit (e.g. meter), the surface area has this unit squared (e.g. square meter), the volume has this unit to the power of three (e.g. cubic meter). A/V has this unit -1.